ARB Approved Contractors for the South Hams. A reliable tree surgeon covering Plymouth, Dartmoor and beyond. We work hard to maintain extremely high standards of service, maintaining our position as one of Devons finest arborist services. 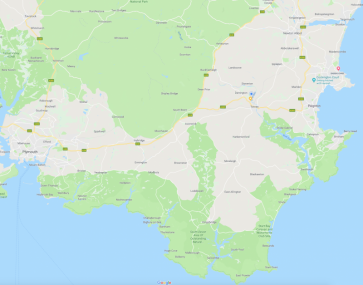 We are based in South Brent on Dartmoor in the South Hams which puts us in the perfect position to provide tree care services to our clients throughout Plymouth, Ivybridge, Tavistock, Totnes, Ashburton & Kingsbridge. Very pleased with the work that Aran and the team did. Very professionally done and reasonable prices, will definately use them again. Aran and his team have done some great work for us. Happy to recommend them for your arboreal needs. Many thanks to Aran and his team for a job well done taking down three large leylandii trees, a cankered ash and various trees from our bank running along a lane. Works had to be halted with the discovery of a nest high up in one of the trees and only resumed two weeks after to ensure any hatched chicks had fledged and flown. Reasonably priced, polite and very professional. Would recommend. Many thanks Aran for a very neat and professional job on our copper beech tree. I would certainly recommend Dart Forest Trees. Everything was cleared up afterwards and they even put down a large tarpaulin to protect our (very muddy) lawn. Excellent service - trees, hedges and bushes all look great now! All cuttings taken away - highly recommend! Efficient, polite & professional service. Dealt with an emergency for us this morning - part of our oak tree had fallen into the road. Aran and a colleague were on site in an hour. Cut & cleared the branch, inspected the remainder of the tree & even swept up after themselves! Wouldn't hesitate to recommend them. Can highly recommend Dartforest, Aran and Owen were knowledgable, professional and fun! They pruned a very old apple tree and tidied up a very neglected garden. We shall always use them in the future for our new garden. Rates are fair too. Thank you gents. Aran did a great job on Monday with the thinning of our very large sycamore trees on an awful wet day ! Very professional service,left our garden clean,& tidy. Would not hesitate to use again. Thank you. Very happy to recommend Aran who undertook tree and hedging surgery for us. Very professional and reliable service provided. Thank you. A really great job of taking down a rather large turkey oak tree and the annual trim of the garden hedge. Very knowledgeable, good price and a friendly service. We are highly experienced, qualified arboricultural contractors with the skills, knowledge and industry-recognised insurance policies to perform expert, professional tree surgery in Plymouth, South Brent, Ivybridge, Totnes and Tavistock. We were very pleased with the tree cutting work completed by the team. All done exactly as specified and cleared up very well afterwards. Friendly and knowledgeable guys. Prompt, polite, professional service and reasonable charges, too. Came to work this morning to find a big oak tree branch fallen from one of our trees into the road. Aran was on site with a colleague in an hour, cut & cleared it, inspected the remainder of the tree and even swept up after! No hesitation in recommending this company. Highly recommended. Quick, careful, professional - and not expensive.P.G.Black, Ashburton, May 2017. Great service and reasonably priced. We have used Aran for a couple of jobs now and have been very pleased with the work that has been done. Thank you! 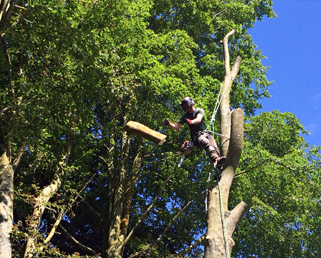 Finding the right Devon tree surgeon just got easier. Of course you need expert professionals, but we know you also want to hire people who are easy to deal with. We’re friendly, reliable and respectful of any home or business we visit. 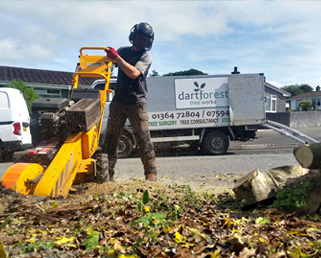 Our professional tree maintenance services span the whole of Devon and across Dartmoor, from Teignbridge, to the South Hams. 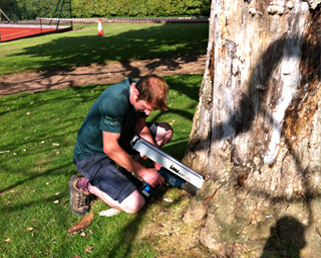 Our tree consultancy services are relied upon by many customers who want to be sure that they’re covered, legally. Over the years we have provided Professional Arboricultural Reports to a number of large national utility organisations, local town councils, academy schools, commercial businesses and a large number of domestic landowners.